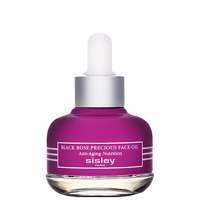 sisley BLACK ROSE PRECIOUS FACE OIL 25ml is sisley’s first skin care oil for dry or mature skin. With a high concentration of active ingredients, this silky-smooth dry oil prepares, nourishes and has an anti-aging effect; rich in omega 3 and 6, it prepares the skin to receive its daily skin care. A powerful blend of plant-based active ingredients that nourish, regenerate and protect and provide the essential elements for the skin’s vitality and youthfulness. Black Rose extract lies at the heart of the formula and lends a wonderful silky softness. It is combined with Plum and Camelina oils maintain the lipid balance of the epidermis and essential oils of Bulgarian Rose and Magnolia which have toning and soothing properties for a delicious awakening of the senses. Active Ingredients: Plum Oil, Camelina Oil, Phytosqualane, Tocopherols, Black Rose, Bulgarian Rose Essential Oil, Magnolia Essential Oil, Geranium Essential Oil. sisley BLACK ROSE PRECIOUS FACE OIL 25ml was found on 3 websites and was price compared using EAN: 3473311320001. The cheapest sisley BLACK ROSE PRECIOUS FACE OIL 25ml is shown as the main item, prices range from £112.50 to £158.50, excluding delivery. Price comparison based on price and delivery charges, with any valid discount codes being applied, is shown in the table above. Prices and information correct at the time of publication.